Wolverine wakes up at the mansion in 2023 to find Iceman, Rogue, Colossus, Kitty Pryde, Beast, Storm, Jean Grey, Scott Summers and Xavier all alive. Wolverine speaks to Xavier, who is also aware of the changes in history. Back in 1973, the younger Wolverine is rescued by Mystique, who is disguised as William Stryker. X-Men: Days of Future Past had 1,311 visual effects shots produced by twelve studios. Richard Stammer served as the overall effects supervisor based on his work for Prometheus. The leading company was Moving Picture Company, who created the future Sentinels and worked on the sequences involving the X-Jet and Cerebro's red virtual world. The Sentinels' scaled bodies were created by adapting a tool originally developed to create hair and fur, which would later evolve into creating a proxy representation of each individual scale as a "follicle". Another major contributor was Digital Domain, with effects from the 1973 portion that encompassed nearly a third of the work. These included the Sentinels, Mystique's transformations and eyes, and various digital environments. Digital augmentation turned a remote airstrip into a Vietnam prisoner camp and added Paris' famed mansard rooftops to the Montreal locations. The environment work based on Washington, D.C. required the team to study period references of the National Mall and White House, and photograph almost all of RFK Stadium to create a detailed digital replica.Rising Sun Pictures created a sequence considered by many reviewers the centerpiece of the film's effects, where Quicksilver uses his super speed in the Pentagon kitchen. Depicting how, to a speedster, actions in real time come down to a virtual standstill, objects float around in slow motion. After doing LIDAR scan of the kitchen set, the digital recreation added many computer generated props - cooking gear, cutlery, vegetables and water released by a fire sprinkler system - rendered in near microscopic detail regarding placement and lighting, particularly because the footage had to work in 3D. To simulate Quicksilver running on the walls, Evan Peters and a stunt double were filmed in both the set being suspended by a harness and on a treadmill that stood in front of a chroma key green screen. Only Peters' legs were digitally replaced. Despite the sequence only having 29 effects shots, it required nearly seven months of work from RSP's team of 70 artists. Elsewhere, the film was the highest-grossing film during its opening weekend, taking $172 million, making it Fox International's highest opening weekend. The film's highest-grossing debuts were in China, South Korea, the United Kingdom, Ireland, and Malta. It was also the highest-grossing debut for a 20th Century Fox film in 11 markets, including South Korea, Brazil, the Philippines, and India. 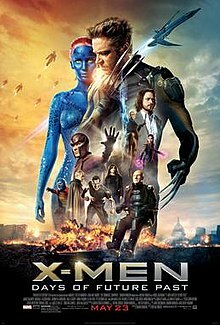 It became the highest-grossing X-Men film in Argentina, Australia, Austria, Belgium, Brazil, China, Colombia, Croatia, Czech Republic, Denmark, Ecuador, Egypt, Finland, France, Hong Kong, Hungary, India, Israel, Italy, Malaysia, Lebanon, Mexico, the Netherlands, New Zealand, Norway, the Philippines, Poland, Singapore, Slovakia, South Korea, Sweden, Thailand, the United Kingdom & Ireland, and Venezuela. ^ "X-Men: Days of Future Past (12A)". British Board of Film Classification. May 9, 2014. Archived from the original on June 8, 2014. Retrieved May 9, 2014. ^ a b "X-Men Days of Future Past (2014)". British Film Institute. Retrieved September 24, 2018. ^ 2014 Feature Film Study (PDF) (Report). FilmL.A. Inc. p. 17. Retrieved November 11, 2017. ^ Adam B. Vary. "Anna Paquin Will Be In "X-Men: Days Of Future Past" After All". Buzzfeed.com. Retrieved May 20, 2014. ^ "Anna Paquin Will Appear In X-Men: Days Of Future Past &#124, Movie News &#124, Empire". Empireonline.com. Retrieved May 20, 2014. ^ Brent McKnight. "Why Anna Paquin Didn't Mind Being Cut From X-Men: Days Of Future Past". cinemablend.com. Retrieved November 30, 2015. ^ Terri Schwartz. "X-MEN: ANNA PAQUIN IS GAME TO COME BACK FOR MORE". ign.com. Retrieved November 30, 2015. ^ "Fan Bingbing excited to be part of the X-Men movies - Movies &#124, The Star Online". Thestar.com.my. Retrieved May 22, 2014. 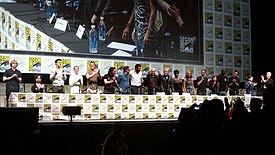 ^ "'X-Men: First Class' Sequel Ideas Emerge". Screenrant.com. Retrieved May 20, 2014. ^ "2014 Feature Film Study" (pdf). FilmL.A. p. 6. Retrieved March 30, 2018. ^ "Rising Sun Pictures Makes Time Stand Still in "X-Men: Days of Future Past"". Rising Sun Pictures. Retrieved January 17, 2015. ^ "Oscar nominations 2015: Adelaide visual effects supervisor 'shocked' by Oscar nomination". ABC Online. January 17, 2015. ^ Marianne Garvey; BrianNiemietz (May 12, 2014). "'X-Men: Days of Future Past' stars assemble in New York premiere". Confidenti@l. Daily News. Retrieved May 14, 2014. ^ Joseph, Noah (November 24, 2014). "Kia Sorento bares its claws for X-Men Special Edition". Autoblog.com. Retrieved September 28, 2015. ^ O'Connell, Sean. "X-Men: Days of Future Past Review - CinemaBlend.com". Cinema Blend. Retrieved July 4, 2014. ^ Thomas, William. "Empire's X-Men: Days of Future Past Movie Review". Empire. Retrieved June 14, 2014. ^ "2014 Young Hollywood Awards Winners [Recap/Review]". Liberty Voice. Retrieved July 29, 2014.